Get ready to travel to the western frontier, where the action is always happening. So embrace yourself for a truly unique and a one of a kind gaming experience that is powered by Microgaming that you can get to enjoy here for free by using practice credits. Just choose the lines, specify the wagers and spin the reels so you can get immersed into the experience that the game has to offer as well as earn the great rewards that the video slot machine has in store for you and all of the other players. 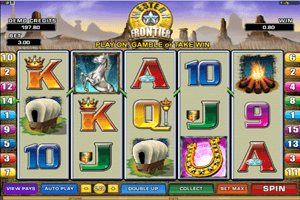 Play Western Frontier Slot here. The game has a setup of 5 reels and a total of 15 lines. The symbols that appear on the slot machine’s reels are all inspired by the theme that the game is trying to convey. This is why the symbols include a black stallion, a tent, a golden horseshoe with diamonds, a wooden cart, camp fire, guns and ammo and card icons. The game has a special feature that is called the Indian Feature which is activated to players who get 3 or more golden horseshoe, the scatter icon, on the reels of the game. When that happens, they will earn 8 free spins on the video slot machine with the ability to earn extra spins when they get 3 more scatters on the reels. Any wins creates with the help of the wild icon, the stallion, will be multiplied by 2x.